Posted by Jon in Hasbro, News, Transformers with 0 comments. I believe this was briefly mentioned at Toy Fair, but the score to the original Transformers television series will be released on vinyl Friday, March 9, 2018. For collectors, there are three different exclusive designs based off of Megatron, Optimus Prime, and Bumblebee. Check out the official word and pictures below from Hasbro. BURBANK, Calif. – March 6, 2018 – Hasbro, Inc. (NASDAQ: HAS), Enjoy The Ride Records and Sony Music/Legacy Recordings announced today the release of Hasbro Studios Presents ’80s TV Classics: Music from The Transformers on vinyl in three different color variants, available at select retailers Friday, March 9. This is the first official release of the score in any format and includes the iconic opening theme song and more than 45 minutes of unreleased music by composers Robert J. Walsh, Johnny Douglas, Anne Bryant and Ford Kinder. The album features music from seasons 1-3 of “The Transformers” animated series which debuted in 1984. 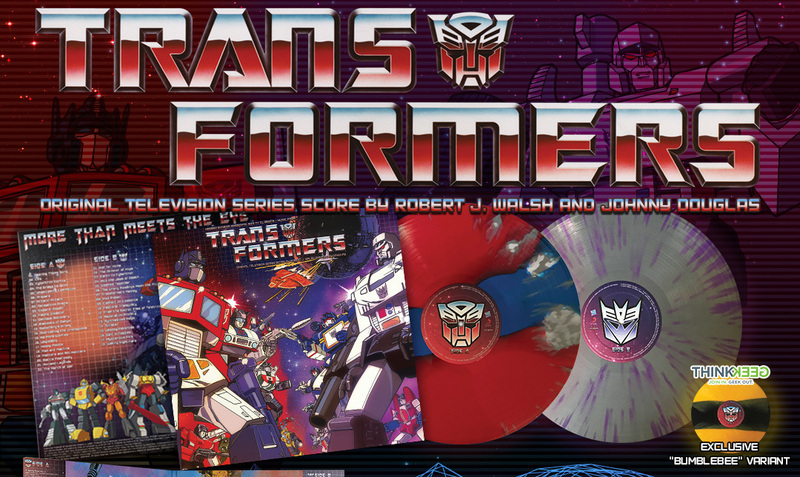 The Hasbro Studios Presents ’80s TV Classics: Music from The Transformers will be available for $18.99, with the Optimus Prime and Megatron variants available through EnjoyTheRideRecords.com and the Bumblebee variant available exclusively through ThinkGeek.com. Since their launch in 1984, Transformers has grown to be one of the world’s most recognizable and successful toy and entertainment brands. Driven by compelling characters and a rich storyline, Transformers revolutionized children’s entertainment as one of the first properties to produce a successful toy line, comic book, TV series and animated film. With more than 30 years of history, thousands of unique Transformers robots have been introduced through toy lines, animated TV series, comic books and animated and live-action feature films. Enjoy The Ride Records is a Long Island based record label, specializing in cult following reissues throughout a variety of genres. Enjoy The Ride Records works with a group of diverse licensing partners throughout the entertainment industry to help create and reissue albums in a unique, limited release format since 2008. Founded in 1990 by CBS Records (rebranded Sony Music in 1991), Legacy has expanded on its original mission (preserving and reissuing back catalogs of Columbia Records, Epic Records and associated CBS labels) to provide new and innovative avenues for artist and repertoire exposure including Grammy winning curated retrospectives, social media campaigns, Oscar winning soundtracks, new talent signings and groundbreaking campaigns for established artists and catalog projects.